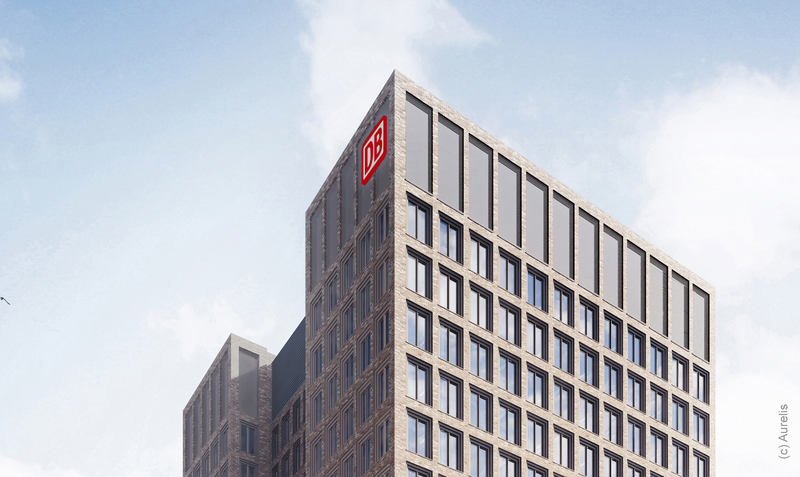 The winner of the design competition for Deutsche Bahn AG’s DB Tower in Europaviertel district has been chosen: While the building follows a design by schmidtploecker Architekten, Aldinger Architekten from Stuttgart have now provided the exterior appearance. The competition was organized by Aurelis Real Estate, in cooperation with the City of Frankfurt. The jury consisted of Mike Josef, head of Planning Department of the City of Frankfurt; Martin Hunscher, Urban Planning Department of the City of Frankfurt; Joachim Wieland, CEO of Aurelis; and renowned architects from the region and other representatives of Deutsche Bahn and Aurelis. Five other architectural offices participated in the competition alongside Aldinger Architekten. The 60-meter-high DB Tower (approximately 29,000 square meters of rental space) is being built along with the planned office building The Brick (approximately 23,000 square meters of rental space). Aurelis will be constructing both buildings for Deutsche Bahn. The two companies signed a long-term lease in October 2017. The main objective of the competition was to unify the two buildings in a harmonious yet exciting way. The Brick will be built according to the design of schmidtploecker Architekten from Frankfurt. Aldinger Architekten will work closely together with schmidtploecker. The Frankfurt architects had already been commissioned with the overall planning for The Brick and the DB Tower before the competition. The short construction period also had to be taken into account in evaluating the competition results. Deutsche Bahn would like to move into the building by 2020. Aurelis had aleady broke ground on The Brick site last year. The construction work will be carried out by Züblin. Joachim Wieland on the implementation of the overall project: “The schedule is very ambitious. It helps us that planning for The Brick is already well underway.” The planning application for the DB Tower is due to be submitted in spring. The designs of the six contestants will be exhibited from April 4 – 20, 2018 in the foyer of the Planning Department (Kurt-Schumacher-Strasse 10, 60311 Frankfurt am Main) and can be viewed Monday to Friday from 8:30am to 6:00pm. 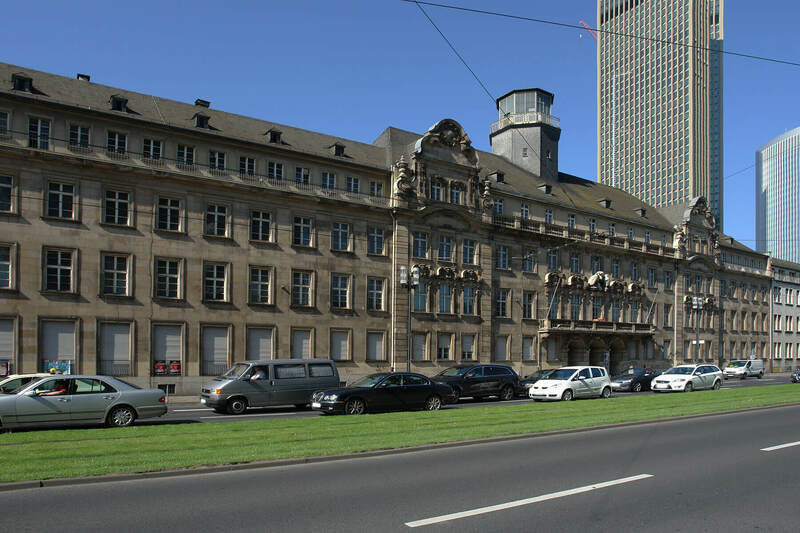 The former police headquarters at Friedrich Ebert Anlage in Frankfurt have changed hands. The Düsseldorf-based project developer, Gerch Group have bought the property in its prime location with existing buildings for 212.5 million euros. Previous buildings are all due to be demolished and about 800 million euros are being pumped into the new development of the property. The state government and City of Frankfurt fiercely fought over the project. Construction for the new development will begin in 2022, and the whole project is expected to be completed by 2026. This information was announced by Hesse Finance Minister, Thomas Schäfer (CDU): “Frankfurt can be happy. Something is happening in a prominent place in the city.” he said. In years to come, a modern ensemble of flats, offices and a hotel could be built in the area between the main train station and the trade fair. The Minister of Finance said that a day care centre was also added, as well as a gymnasium for the Falkschule. Thus, in the opinion of Minister of Finance, Schäfer, the requirements that the city of Frankfurt have set for future use of the site have been fulfilled. According to the minister, the sale proceeds will be reinvested by the state of Hesse into the Frankfurt area, especially in education and housing. The former state-owned site covers more than 15,000 square meters. An architectural competition will determine which design will actually be chosen for construction here. The building permit allows a mixture of housing, office and hotel usage on the site, where a high-rise building to a maximum height of 145 meters (475 feet) can be built. The former police headquarters are now dilapidated and have been vacant since 2002. In September 2017, the State of Hessen started the sales process, negotiating with several interested parties. Lord Mayor Peter Feldmann (SPD) accused the state (which owned the police headquarters site) of driving up the price of the terrain, similar to a “private speculator”, so that luxury apartments and expensive offices only were created there. The high price of the overall property to the Gerch Group would later cause buying prices for apartments to rise above 10,000 euros per square meter, leading to criticism of local politicians.